As I've unearthed the Hardee's California Raisins and Tang Mouths, I also came across two McDonald's Changeables. These Transformer-ish Happy Meal toys were given away back in 1989 at the height of the original Transformers popularity. Seeing as how this was a series of eight toys, I assume my family only hit McDonald's twice during the eight week span when these were available. The two pieces that I have are Macro Man (the Big Mac) and Robo Cakes (the Hot Cakes). In all of the time I spent playing with Transformers and Go-Bots, I never really thought about the other possibilities that were out there when it came to these sorts of figures. I guess I just assumed object turning into robots were limited to cars, trucks, and other forms of transportation. Who would have thought that fast food could turn into a robot? 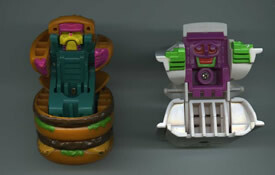 Rather than ramble on about how junky and lame these toys are, I'll refer you to an excellent article about the McDonald's Changeables found elsewhere on the ol' internets. Although the author of this article has a much higher opinion of these toys than I do, the article provides a great amount of detail and insight into this mediocre promotion.